Roy Linwood Clark (born April 15, 1933, Meherrin, Virginia, United States) is a versatile and well-known country music musician and performer. He is best known for hosting Hee Haw, one of the first nationally televised country variety shows in the United States, from 1969-1992. Clark has been an iconic figure in country music, both as a musician and as a popularizer of the genre. Clark is an entertainer, most of all, with an amiable personality and a telegenic presence. During the 1970s, Clark frequently guest-hosted for Johnny Carson on The Tonight Show and enjoyed a 30,000,000 viewership for "Hee Haw". Clark is highly regarded as both a guitarist and banjo player. He is also skilled in classical guitar as well as playing several other instruments. While he has had hit songs as a pop vocalist (e.g., "Yesterday, When I was Young" and "Thank God and Greyhound"), his instrumental skill has had an enormous effect on succeeding generations of both bluegrass and country musicians. Born in southside Virginia, Clark grew up as a teenager in southeast Washington, D.C. where his father worked at the Washington Navy Yard. At the age of 14, Clark began playing banjo, guitar, and mandolin, and he won two National Banjo Championships by the age of 17. He was simultaneously pursuing a sporting career, first as a baseball player, and then as a boxer, before switching over to music full time. At the age of 17, he had his first appearance on the Grand Ole Opry. By 1955, he was a regular on Jimmy Dean's Washington, D.C. television program. Dean, who valued punctuality among musicians in his band, the Texas Wildcats, fired Clark for habitual lateness, telling him "you're the most talented person I've ever fired." In 1960, Clark went out to Las Vegas where he worked as guitarist in a band led by former West Coast Western Swing bandleader-comedian Hank Penny. During the very early 1960s, he was also prominent in the backing band for Wanda Jackson during the latter part of her rockabilly period. When Dean was tapped to host The Tonight Show in the early 1960s, he asked Clark to appear, introducing him to a national audience for the first time. Subsequently, Clark appeared on The Beverly Hillbillies as a recurring character (actually two, he played businessman Roy Halsey and Roy's mother, Myrtle). Once, on an episode of the Sunday evening Jackie Gleason Show dedicated to country music, Clark played a blistering rendition of "Down Home". Later, he even appeared on an episode of The Odd Couple where he played "Malaguena". In 1963, Clark signed to Capitol Records and had three top 10 hits. He switched to Dot Records and again scored hits. He later recorded for ABC Records, which had acquired Dot, and MCA Records, which absorbed the ABC label. In 1969, Clark and Buck Owens were the hosts of Hee Haw. The show was dropped by CBS Television in 1971 but continued to run in syndication for twenty more years. During its tenure, Clark was a member of the Million Dollar Band. In 1983, Clark opened the Roy Clark Celebrity Theatre in Branson, Missouri, becoming the first country music star to have his own venue there, and beginning a trend which led to Branson becoming a center of live music performance, as it is today. Many of the celebrities who have played in Branson first entertained at the Roy Clark Celebrity Theatre. Clark frequently played in Branson during the 1980s and 1990s. He has since sold the venue (now owned by the Hughes Brothers and renamed the "Hughes American Family Theatre") and gone back to a fairly light touring schedule which usually includes a performance with Ramona Jones and the Jones Family Band at their annual tribute to Clark's old "Hee Haw" co-star Grandpa Jones in Mountain View, Arkansas. In addition to his musical skill, Clark has often displayed his talents as a comedian and actor. During his years on the variety show Hee Haw, Clark entertained with numerous comedy sketches, including a recurring feature where he played the clerk of the "Empty Arms Hotel". Clark released several albums of his comedic performances, to varying critical acclaim and commercial success. On August 22, 1987, Clark was made a member of the Grand Ole Opry. Clark plays an annual benefit concert at Longwood University in Farmville, Virginia, the proceeds of which go to fund scholarships for aspiring musicians. For many years Clark has made his home in Tulsa, Oklahoma. 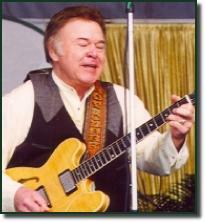 Roy Clark Elementary School in Tulsa's Union School District was named in his honor in 1978. On February 4, 2009 Roy Clark was inducted into the Country Music Hall of Fame along with Barbara Mandrell and Charlie McCoy.